One of our favorite restaurants is Panda Express. I know, I know... it's neither the healthiest nor the most cultured place to eat, but we love it! Last week we ate there. One of the dishes we had was their String Bean Chicken. As I ate it, I thought—I could make this! So a few days ago, I did. It is not an exact copy of the recipe... it's a little more strongly-flavored. I actually like it better. This recipe makes about 3 generous portions. Grill chicken on hot pan or outdoor grill. (If you choose the former, hopefully you can do it WITHOUT setting off the fire alarm, which is what has happened both times I've used my grilling pan in my new apartment!) When chicken is cooked through, cut into small cubes and set aside. In wok or large skillet, sautee onions in olive oil until tender and lightly browned. Remove from wok and set aside. 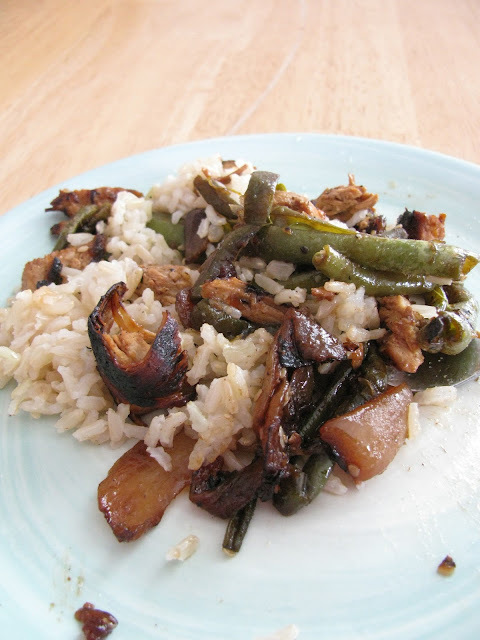 Put green beans in wok and coat with olive oil. Sautee until beans are beginning to brown. While beans are cooking, toast sesame seeds—you can do this either by sprinkling them onto a cookie sheet and placing it in the oven on broil for 1-2 minutes, or you can sprinkle them on a plate and microwave for 1-2 minutes. When toasted, they'll be a very light brown. Once beans are done cooking, remove from pan (or, if you have a wok, push the beans up on the sides to leave the center clear). In a bowl, combine cornstarch and teriyaki and pour into wok center (this will smoke). Quickly whisk the sauce for a moment; it will start to thicken immediately. Add beans, onions, chicken, and sesame seeds back into wok. Stir everything together for about a minute, until sauce has thickened. Serve over rice or noodles. I make caramels once a year... when I visit my parents' house. I LOVE soft caramels and literally would eat the entire pan in about two sittings if I made them at home! This is my favorite recipe, honed and perfected over the last several Christmas seasons. It is labor-intensive in that it involves a considerable deal of time hanging out at the stove, but it's not difficult. If you follow the directions exactly, you will get PERFECT caramels every time! Butter 9 x 13 pan, set aside. In large saucepan or cooking pot (you really want a 4-5 quart pot because it will boil very high), combine sugars, corn syrup, butter, and salt and heat on medium. When ingredients are melted, add 1/2 cup cream. Bring to a boil (over medium heat), stirring frequently. Slowly stir in remaining cream and milk without disrupting boil—you want to pour it in a slow drizzle so that your caramel keeps boiling the whole time (it will not be boiling much by the end, though—it will need to heat back up). Bring back to a boil and cook, stirring frequently, until 242 degrees F (or soft ball stage, but for caramels I do recommend a thermometer—they can be pretty picky). Remove from heat, add vanilla, and pour into prepared pan. Do not scrape the sides of your pot—just let the caramel pour into the pan. The stuff on the sides has been cooked at a higher heat than the rest, and if you scrape it into your pan you will end up with chunks of caramel that has gone grainy. (I like to pour out my pot, give it about 10 minutes, and then get a spoon and eat the stuff off the sides!) To speed cooling, put pan in fridge. It takes several hours for your caramels to cool completely. Cut into squares and wrap in buttered wax paper... or, if you're like my family, skip the waxed paper and just eat them straight out of the pan all week!